For Florida Panthers GM Dale Tallon, signing forward Peter Mueller was a gamble well worth taking. "I hope to get him back to what he was as a rookie," Tallon said on a conference call Thursday after giving oft-injured Mueller a one-year, $1.75 million contract. "He seems to be revitalized, and we did our due diligence. We brought him in here and checked him out from toes to nose, and everything checked out fine. He understands this is a great opportunity for him. He's a top-six forward. He has size and skill, and he's still young (24). It's well worth the risk for us to sign him to a one-year deal and hope he gets back to what he was before he was injured." 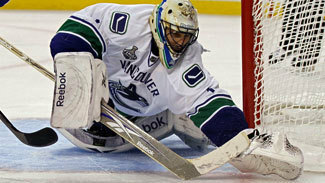 The Panthers are one of the teams rumored to be involved in trade talks to land Vancouver Canucks goaltender Roberto Luongo. The Panthers already have goaltenders Jose Theodore, Scott Clemmensen and Jacob Markstrom under contract, but GM Dale Tallon said Thursday he's not ruling out anything. "I'm open to anything that makes sense as far as the Florida Panthers winning a Stanley Cup," Tallon said, "and we'll listen to anything possible." The 33-year-old Luongo, who was traded by the Panthers to Vancouver six years ago, has 10 years and about $53 million remaining on his current contract. The Canucks signed backup Cory Schneider to a three-year, $12 million deal this summer. Panthers forward Kris Versteeg is scheduled to have his arbitration hearing July 23. As far as Tallon is concerned, the ball is in Versteeg's court in terms of getting a deal done before then. "They decided to go to arbitration so nothing's changed today as far as we're concerned," Tallon said. "Either way, he's going to play here and he's going to make a lot of money." In his first season with the Panthers, Versteeg had 23 goals and 31 assists in 71 games. His 23 goals and 54 points were a career-best. Meanwhile, Nick Bjugstad, the Panthers' first-round pick in the 2010 draft, decided Thursday to return to school. The 6-foot-6, 220-pound center is back for his junior season at the University of Minnesota, and that's just fine with Tallon. "We never tell kids what to do. That's our philosophy," Tallon said. "If a kid wants to turn pro, then that’s his decision. We told him to weigh the pros and cons. Either way, whatever decision he made, we stood by him and supported him. He has a brilliant future with us and we're excited about it whenever he starts." The 19-year-old had a chance to make the Panthers out of training camp, but instead opted for one more year in school. "It is definitely a relief that I've come to my decision," Bjugstad told reporters. "I am very confident about it and I am kind of relaxed now." Mueller has found it impossible to stay healthy in recent years. As a rookie with the Phoenix Coyotes in 2007-08, he played 81 games and had 22 goals and 32 assists. He followed that with 13 goals and 23 assists in 72 games during his sophomore season, but was dealt to the Colorado Avalanche at the trade deadline in 2010 after slumping to four goals and 13 assists in 54 games with Phoenix. After a resurgence with the Avs near the end of that season that saw him register 20 points in 15 games, he suffered a concussion that cost him the rest of the season. He signed a two-year deal with the Avs that summer only to suffer a second concussion during training camp that sidelined him for the entire 2010-11 season. Mueller had seven goals and nine assists in 32 games with the Avs last season, as he was besieged by groin injuries and post-concussion issues. The Avalanche decided not qualify Mueller, making him an unrestricted free agent. The native of Bloomington, Minn., passed his physical with the Panthers earlier this week and is ready to turn the page on his past and begin again with his new club. "I'm just looking for a fresh start -- obviously it's no secret with my past," Mueller said. "As I spoke to Dale, he's basically told me what he's expecting out of me and I'm expecting a lot personally from myself. I'm coming in here with a great attitude and just ready to rock and roll this coming season." Mueller said he's been working out with no limitations or issues with his groin and has not experienced any complications related to his concussions. "Every time I talk to doctors since I got cleared last time in January, everything is good," Mueller said. "The doctors are behind me 100 percent. Nothing is really a red flag. Everything is good to go. I've been working out ever since I got cleared. I'm focused on getting better each and every day. To be honest, I haven't felt this good since coming into the League my first year." Taking a chance on a young talent who has battled injuries is nothing new for Tallon. Last summer, he signed forward Tomas Fleischmann, who was sidelined by blood clots twice during his career, to a four-year, $18 million deal. Fleischmann rewarded Tallon's faith by leading the team in scoring with 21 goals and 61 points in 82 games. "We're hopeful he can have the same type of production as Flash," Tallon said of Mueller. "He does have top skill and we're going to give him every opportunity to succeed and play with some good players and possibly match up with [Jonathan] Huberdeau or [Scottie] Upshall. He's a versatile player. He can play center or right wing. That's a good thing to have." Tallon also said he envisions Mueller playing the point on the power play and that former teammates -- defenseman Ed Jovanovski and Upshall, who played with Mueller in Phoenix -- gave him glowing reviews. "They had positive things to say," Tallon said. "They had him when he was really young. He's married now and seems to be more mature. He's really excited about his future here. We got him on a short-term deal, so he's got to be eager to prove his worth. All things look positive for us and we get younger in the process." Mueller said he had other teams that desired his services despite his injury-riddled past, but the Panthers were the most eager team and the best fit. "Off the get-go, Florida seemed the most interested," Mueller said. "I know that Dale and my agent's been talking ever since the free-agent frenzy started, so it's just really awesome that one team showed that much excitement and interest right off the bat. "(He's most excited about) playing more of an offensive style game which is going to help me and also a change of scenery. I know some people there, but first and foremost, I'm excited for this opportunity to show what I can do in a new organization."